Connectivity and automation drive smart logistics solutions to improve efficiency, safety and productivity in confined areas. UD Trucks revealed its first demonstration of Level 4 (L4) automation for heavy-duty trucks to an audience of media and business partners at the UD Experience Center at its headquarters in Ageo, Saitama on Wednesday, December 12. The course emulated the real-use conditions of heavy-duty trucks in confined areas such as ports, factories, warehouses and construction sites, where automation technology will help improve efficiency, safety and productivity. L4 automation is the last step towards fully-automated transportation, where the driver can give the vehicle full autonomy over every aspect of driving. The demonstration highlighted automation technologies including GPS (Global Positioning System), radar, Lidar, onboard camera and software which enable such high-precision automation for starting, stopping, slaloming, U-turns and reverse driving. Balancing and maneuvering heavy-duty payloads in unexpected road conditions requires a high level of expertise, especially in steering technology. The heavy-duty truck Quon will help stabilize automated driving with the automated manual transmission “ESCOT VI” and its proven steering system. 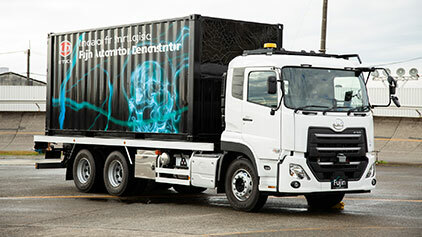 UD Trucks will continue demonstrations of autonomous driving and electric drive prototypes, aiming to complete field tests and customer trials ahead of Tokyo Motor Show 2019—with a view toward daily operation by 2020 and commercialization of fully-electric trucks and autonomous trucks by 2030.